One of the most crucial aspects of a listening and spoken language intervention with children who are deaf or hard of hearing is PARENT TRAINING. Parents must be empowered to be their child’s primary teacher and language facilitator. Professionals help parents along this journey by modeling skills and techniques, providing information, and guiding and coaching parents to implement listening and language strategies all day, every day in the course of normal activities in the family’s life. 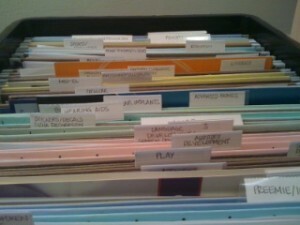 I call it my “Resource File”. 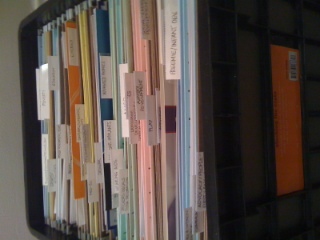 It’s just a crate with some hanging file folders, but the real trick is in how I organize the information within. COMMUNICATION OPTIONS: The first step in counseling new parents — info on the full spectrum of options for teaching children who are D/HOH. LISTENING AND SPOKEN LANGUAGE: Parents have chosen auditory-verbal/auditory-oral methods to teach their children to listen and speak. Principles of AVT, AVT techniques, guiding documents of AV/AO practice, FAQs about AVT. UNIVERSAL NEWBORN HEARING SCREEN/EARLY INTERVENTION: What are the first steps? State laws, referral programs, early intervention agencies and services. ACTIVITIES: Time to play! Speech, language, and listening therapy ideas. CHILD DEVELOPMENT: Cognitive and physical milestones. Help parents facilitate their child’s development and monitor any areas of weakness. Often, reviewing a developmental hierarchy with parents can give them an opportunity to express concerns about their child’s development or help a parent in denial see that their baby is struggling and that deafness may not be the only thing going on in their child’s life. Remember, the only problem we can’t work on is one we don’t acknowledge! SOCIAL-EMOTIONAL DEVELOPMENT AND SKILLS: Helping parents help their children develop age-appropriate social skills and support their secure attachment and healthy emotional development. CAUSES: Information on syndromes, medical conditions, environmental factors, etc. that can cause hearing loss. AUDITORY DEVELOPMENT: Development of listening skills and auditory memory. LANGUAGE DEVELOPMENT: Development of all aspects of language — from babbling to conversation! DECORATIONS, DECALS, and STICKERS: My favorite section! Fun stuff to jazz up HAs/CIs/Bahas. Some stickers I have “in stock” and others are just brochures for companies that sell clips, decals, etc. for parents to order. HEARING AIDS: Different features, manufacturers, troubleshooting, basic info on how HAs work. BAHA: What is Baha, who makes it and how does it work? COCHLEAR IMPLANT: General info about CI candidacy, how a CI works, mapping, troubleshooting, etc. COCHLEAR: Specific information about Cochlear’s CIs. ADVANCED BIONICS: Specific information about AB CIs. MED-EL: Specific information about MED-EL’s CIs. FM/SOUNDFIELD/ALD: Info on FM systems, soundfield systems, and other assistive listening devices (ALDs) like vibrating alarm clocks, flashing smoke alarms, t-coil neckloops for phones, headphones, etc. SPEECH ACOUSTICS/AUDIOLOGY: Info on audiological tests, audiograms, what speech sounds are audible at various intensity levels (loudness) and frequencies (pitch). CULTURAL and LINGUISTIC DIVERSITY: Info on working with families from a variety of backgrounds, info on families who are not native English speakers (*NOTE: Many of my resources are in English and Spanish. I just file the Spanish version of the resource in its appropriate category, not in this folder). PARENTING and FAMILY ISSUES: Dealing with parents’ feelings about their child’s hearing loss, working with siblings, discipline, behavior issues. TEENS: Specific issues about hearing loss and adolescence. SENSORY and OTHER SPEECH-LANGUAGE ISSUES: Additional speech-language problems that are not hearing loss-related, sensory integration dysfunction and therapy. EDUCATION: Mainstreaming, accommodations, IEPs, IDEA. SPORTS and ACTIVITIES: Information on CIs/HAs and sports and other extracurricular activities. SCHOOLS and PROGRAMS: Brochures from listening and spoken language schools and programs around the country and around the world. 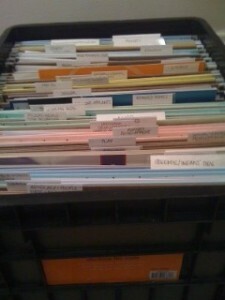 Within each folder, I take the original document and write ORIGINAL on each page in yellow highlighter. That way I never lose my original document, and when I place the paper on a black and white copier, the yellow highlighter markings do not show up. If I have extra copies of a resource besides the original, I paperclip them behind the original document for quick hand-outs to parents. When the stack starts running low, I know it’s time to make more copies. This works for me! Hope it helps! This entry was posted in Elizabeth Rosenzweig MS CCC-SLP LSLS Cert. AVT and tagged Auditory Verbal Therapy, Professionals, Therapy Tips. Bookmark the permalink.